George Peoples, a resident of Bismarck at the time, purchased lots 14 and 15 of block six in Mandan in July of 1881 from the Northern Pacific Railroad for $375. In 1882-83 and at a cost of $23,500 he built a hotel from brick manufactured at a facility just east of Mandan. 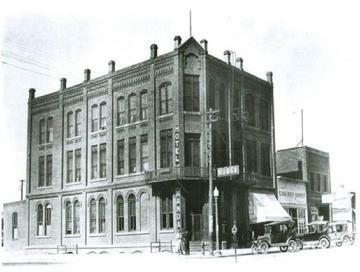 Located in the heart of Mandan on the northeast corner of Main Street and Collins Avenue, it became the city's second three-story building (after the InterOcean Hotel located four blocks west on Main Street) and the city's first brick three story building. It opened in April 1882. Walls were five bricks deep on the first floor, four bricks deep on the second floor and three bricks deep on the third floor. The three-foot by 12 foot floor timbers were purchased from a flourmill that was dismantled somewhere in Minnesota. Bingenheimer and Taylor's Drug and Fancy Goods store operated from it's ground floor Main St retail space, with the S Smith Dry Goods store operating from it's Stark Ave (now Collin's Ave) location. Gussners Meat Market was built east of the hotel and supplied meat to the dining room. A second story was added to that building sometime later, but a channel was left between the buildings so tha the windows could be opened. Peoples later sold the hotel to Pat McGinley who would rename it "The McGinley." Before the advent of air conditioning, families would go to the hotel's fine dinning room during the summer and enjoy a delicious home-cooked meal rather than build fires and heat up their homes. Jane Lauscher, a widow of a very successful Red River bonanza farmer, purchased the hotel and operated it from about 1908 through 1916. The building underwent a major remodel of the rooms and would subsequently target railroad workers and area ranchers. Nels and Lillian Romer purchased the business in 1916 Nels Romer later served as city commissioner from 1922-23 and later Mandan's Chief of Police. His wife continued to operate the hotel for a short period, even after her husband was shot and killed in the line of duty in December 1926. In 1929, Otto Gussner opened a radiator shop in the back of the hotel building where the city of Mandan housed the fire trucks until a new city hall was built. When the hotel was remodeled in 1947, the radiator shop was moved to the back of the lot on the alley. The building remained in service exclusively as a hotel until 1968. Among the other businesses which were based in the building home were the law offices of John Sullivan, Taylor Drug, the White Star Cafe, John Sand's Bar, St. Elmo's Restaurant (in basement), The Mandan News and Crescent Printing. A Christian coffee shop operated on the main floor for a decade before its final tenant, Ratz Lounge. The building was razed in April and May 2007. Sources of information for this article include: Morton County Roots, published 1985; Morton County Mandan News article on March 16, 2007 by Susan Balcom entitled "Mandan Hotel Has Seen Many Comings and Goings;" and an uncredited page 1 news article in the November 2, 1883 Bismarck Weekly Tribune outling building activitiy in Mandan in 1883.